Update 9.August 2018 (Modification of the section ‘Mathematical Actor Story (MAS) in chapter 4). Update 2.October 2018 (Configuring the whole book now with 3 parts: I. Theory, II. Application, III. Software. Gerd has his focus on part I, Zeynep will focus on part II and ‘somebody’ will focus on part III (in the worst case we will — nevertheless — have a minimal version :-)). For a first quick overview about everything read the ‘Preface’ and the ‘Introduction’. PRE-VIEW: NEW EXPANDED AAI THEORY 23.January 2019: Outline of the new expanded AAI Paradigm. Before re-writing the main text with these ideas the new advanced AAI theory will first be tested during the summer 2019 within a lecture with student teams as well as in several workshops outside the Frankfurt University of Applied Sciences with members of different institutions. 6.1 Actor Story (AS) . . . . . . . . . . . . . . . . . . . . . . . . .
6.1.1 Textual Actor Story (TAS) . . . . . . . . . . . . . . .
6.1.2 Pictorial Actor Story (PAT) . . . . . . . . . . . . . .
6.1.3 Mathematical Actor Story (MAS) . . . . . . . . . . .
6.1.4 Simulated Actor Story (SAS) . . . . . . . . . . . . .
6.1.5 Task Induced Actor Requirements (TAR) . . . . . . .
6.1.6 Actor Induced Actor Requirements (UAR) . . . . . .
6.1.7 Interface-Requirements and Interface-Design . . . .
6.2 Actor . . . . . . . . . . . . . . . . . . . . . . . . . . . . . . .
6.2.1 Actor and Actor Story . . . . . . . . . . . . . . . . .
6.2.2 Actor Model . . . . . . . . . . . . . . . . . . . . . .
6.2.3 Actor as Input-Output System . . . . . . . . . . . .
6.2.4 Learning Input-Output Systems . . . . . . . . . . . .
6.2.5 General AM . . . . . . . . . . . . . . . . . . . . . .
6.2.6 Sound Functions . . . . . . . . . . . . . . . . . . .
6.2.7 Special AM . . . . . . . . . . . . . . . . . . . . . .
6.2.9 Example: An Electronically Locked Door . . . . . . .
6.2.10 A GOMS Model Example . . . . . . . . . . . . . . .
6.2.11 Further Extensions . . . . . . . . . . . . . . . . . .
6.2.12 Design Principles; Interface Design . . . . . . . . .
6.3 Simulation of Actor Models (AMs) within an Actor Story (AS) . 6.4 Assistive Actor-Demonstrator . . . . . . . . . . . . . . . . . .
6.5 Approaching an Optimum Result . . . . .
7.1 Logical Design, Implementation, Validation . . . .
7.2 Conceptual Gap In Systems Engineering? . . . This text is based on the the paper “AAI – Actor-Actor Interaction. A Philosophy of Science View” from 3.Oct.2017 and version 11 of the paper “AAI – Actor-Actor Interaction. An Example Template” and it transforms these views in the new paradigm ‘Actor- Actor Systems Engineering’ understood as a theory as well as a paradigm for and infinite set of applications. In analogy to the slogan ’Object-Oriented Software Engineering (OO SWE)’ one can understand the new acronym AASE as a systems engineering approach where the actor-actor interactions are the base concepts for the whole engineering process. Furthermore it is a clear intention to view the topic AASE explicitly from the point of view of a theory (as understood in Philosophy of Science) as well as from the point of view of possible applications (as understood in systems engineering). Thus the classical term of Human-Machine Interaction (HMI) or even the older Human-Computer Interaction (HCI) is now embedded within the new AASE approach. The same holds for the fuzzy discipline of Artificial Intelligence (AI) or the subset of AI called Machine Learning (ML). Although the AASE-approach is completely in its beginning one can already see how powerful this new conceptual framework is. As preparation for this text one should read the chapter about the basic layout of an Actor-Actor Analysis (AAA) as part of an systems engineering process (SEP). In this text it will be described which internal conditions one has to assume for an actor who uses a language to talk about his observations oft he world to someone else in a verifiable way. Topics which are explained in this text are e.g. ’language’,’meaning’, ’ontology’, ’consciousness’, ’true utterance’, ’synonymous expression. ’AAI – Case Study Actor Story with Actor Model. Simple Grid-Environment’ from 15.Nov.2017). One special point is the meaning of the formal expressions of the actor story. On the cover page of this blog you find a first general view on the subject matter of an integrated engineering approach for the future. 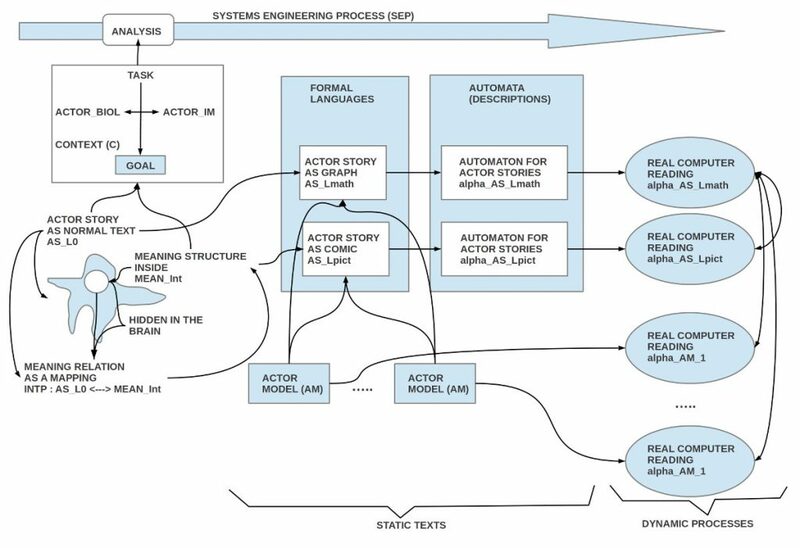 Here we give a short description of the main idea of the analysis phase of systems engineering how this will be realized within the actor-actor interaction paradigm as described in this text. Triggered by a problem document D_p from the problem phase (P) of the engineering process the AAI-experts have to analyze, what are the potential requirements following from this document, all the time also communicating with the stakeholder to keep in touch with the hidden intentions of the stakeholder. The idea is to identify at least one task (T) with at least one goal state (G) which shall be arrived after running a task. A task is assumed to represent a sequence of states (at least a start state and a goal state) which can have more than one option in every state, not excluding repetitions. Every task presupposes some context (C) which gives the environment for the task. The number of tasks and their length is in principle not limited, but their can be certain constraints (CS) given which have to be fulfilled required by the stakeholder or by some other important rules/ laws. Such constraints will probably limit the number of tasks as well as their length. Every task as a sequence of states can be viewed as a story which describes a process. A story is a text (TXT) which is static and hides the implicit meaning in the brains of the participating actors. Only if an actor has some (learned) understanding of the used language then the actor is able to translate the perceptions of the process in an appropriate text and vice versa the text into corresponding perceptions or equivalently ‘thoughts’ representing the perceptions. In this text it is assumed that a story is describing only the observable behavior of the participating actors, not their possible internal states (IS). For to describe the internal states (IS) it is further assumed that one describes the internal states in a new text called actor model (AM). The usual story is called an actor story (AS). Thus the actor story (AS) is the environment for the actor models (AM). An actor story written in some everyday language L_0 called AS_L0 . A translation of the everyday language L_0 into a mathematical language L_math which can represent graphs, called AS_Lmath. A translation of the hidden meaning which resides in the brains of the AAI-experts into a pictorial language L_pict (like a comic strip), called AS_Lpict. To make the relationship between the graph-version AS_Lmath and the pictorial version AS_Lpict visible one needs an explicit mapping Int from one version into the other one, like: Int : AS_Lmath <—> AS_Lpict. This mapping Int works like a lexicon from one language into another one. One remedy to minimize such errors is the construction of automata (AT) derived from the math mode AS_Lmath of the actor stories. Because the math mode represents a graph one can derive Der from this version directly (and automatically) the description of an automaton which can completely simulate the actor story, thus one can assume Der(AS_Lmath) = AT_AS_Lmath. Such a real simulation is dynamic and visible for everybody. All participating actors can see the same simulation and if there is some deviation from the intention of the stakeholder then this can become perceivable for everybody immediately. As mentioned above the actor story (AS) describes only the observable behavior of some actor, but not possible internal states (IS) which could be responsible for the observable behavior. If necessary it is possible to define for every actor an individual actor model; indeed one can define more than one model to explore the possibilities of different internal structures to enable a certain behavior. The general pattern of actor models follows in this text the concept of input-output systems (IOSYS), which are in principle able to learn. What the term ‘learning’ designates concretely will be explained in later sections. The same holds of the term ‘intelligent’ and ‘intelligence’. As in the case of the actor story (AS) the primary descriptions of actor models (AM) are static texts. To make the hidden meanings of these descriptions ‘explicit’, ‘visible’ one has again to convert the static texts into descriptions of automata, which can be feed into real computers which in turn then simulate the behavior of these theoretical automata as a real process. Combining the real simulation of an actor story with the real simulations of all the participating actors described in the actor models can show a dynamic, impressive process which is full visible to all collaborating stakeholders and AAI-experts. Having all actor stories and actor models at hand, ideally implemented as real simulations, one has to test the interaction of the elaborated actors with real actors, which are intended to work within these explorative stories and models. This is done by actor tests (former: usability tests) where (i) real actors are confronted with real tasks and have to perform in the intended way; (ii) real actors are interviewed with questionnaires about their subjective feelings during their task completion. Every such test will yield some new insights how to change the settings a bit to gain eventually some improvements. Repeating these cycles of designing, testing, and modifying can generate a finite set of test-results T where possibly one subset is the ‘best’ compared to all the others. This can give some security that this design is probably the ‘relative best design’ with regards to T.
For a newer version of the AAi-text see HERE..
[DHW07] G. Doeben-Henisch and M. Wagner. Validation within safety critical systems engineering from a computation semiotics point of view. Proceedings of the IEEE Africon2007 Conference, pages Pages: 1 – 7, 2007.
system engineering process. In ISEM 2011 International Conference. IEEE, 2011.